Powers/Abilities: Dakor is able to carry out a number of magical feats. He is able to hypnotise people with ease, and skilled in ventriloquism. 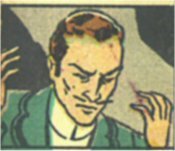 He can either summon wild animals (lions) and tranform things (a gun into a snake), or cast convincing illusions of same. Able to summon storms. 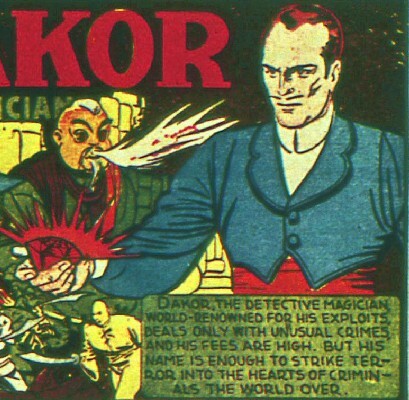 History: (Mystic Comics #1-3, ga) Dakor was a magician and detective, specialising in solving bizarre and distinctive crimes. Once hired, he would go to virtually any lengths to complete the case, even joining the French Foreign Legion when a man he was pursuing did the same. Comments: Thanks to Jess Nevins for allowing me to use information from his excellent Golden Age Heroes Directory and his Guide to Golden Age Marvel Characters. Thanks also to Richard Boucher & Darrin Wiltshire @ PR-Publications for permission to use information from their equally brilliant collection of Golden Age Sites, PR Publications. Their knowledge of Golden Age characters far outstrips my own. Thanks also to Copper for letting me use his Micro Hero version of Dakor.